We have made some adjustments to the matchmaking and ranking systems in Operation Red Crow. We saw that this led to questions from the community, and we have worked with the various teams involved to provide you with some insight. This blog will cover both the matchmaking and rank changes that you have seen come into play following the release of Operation Red Crow. Your skill represents your ability to win a game. Comparing two teams' skill gives you the probability that one team will win against the other. The higher the difference, the more likely a given team is going to win. When two teams with the same skill levels are matched up with each other, they both have an equal shot at winning. The algorithm used in Rainbow Six Siege assigns two values to each player: an estimation of their skill (μ) and the uncertainty of this estimation (σ). The players’ skills are distributed along a Bell curve, centered around 25 (High Silver – Low Gold). The estimation of your skill is probabilistic. In general, the more games you play, the more information we have about you, and the more confident we are about this estimation. This confidence is represented by the uncertainty value sigma (σ). The lower the uncertainty, the higher the confidence. What is the link between skill and MMR? In Season 4, your MMR is proportional to your skill (MMR = 100*μ). In the past, we incorporated a progression system that would take your engagement into account when determining your rank. In other words, you needed to lower your uncertainty to achieve higher ranks. That led to a wide distribution of skill within the same rank. For example, a player whose skill we estimate to be Silver but played a lot of games was able to grind ranks as high as Platinum. This created confusion, as facing players of a given rank would lead to very different experiences. Furthermore, by matching players of similar ranks together, there was no guarantee that they would have similar skill levels. Compared to data from previous Seasons, the average disparity in skill level between opposing teams has been cut in half with the new system. With Rainbow Six Siege being a competitive game, we decided that the MMR should only take your skill into account. The MMR is not a reward system, and any progression you make after a certain point should reflect your improvement in terms of skill. How is the MMR updated after a game? The MMR is updated solely on the outcome of your match. If this outcome is unexpected (for example, you lost against players with a lower skill than your team), the skill updates will be more substantial, and vice-versa. In addition to that, the more confident we are about your skill (i.e., if your σ is low), the smaller the updates will be. Let’s take a simple example with only two players, Craig and Justin. The values in this example do not reflect the actual updates that would happen with our system but it should give you an understanding of the situation. Justin is a Gold player (μ ≈ 29), and has been playing at that level for quite some time. Justin’s rank has a low uncertainty value attached to it, so σ ≈ 3. Justin faces Craig (a Copper ranked player, but he has a lot of heart), and loses. Due to the low uncertainty value, it is likely that Justin just had a bad game, so his skill level would decrease, resulting in μ ≈ 28. This is due to the system taking into account the rank of the enemy you have lost to. If Justin lost to someone that was Gold, the adjustment would be closer to μ ≈ 28.5. Losing to a Diamond would have resulted in a change to μ ≈ 28.9. That being said, Craig is still relatively new to the game, and our system is attempting to determine where he should be placed (μ ≈ 17 and σ ≈ 6). By Tachanka’s grace, Craig won the match, so we would increase his skill level to 20. His victory against Justin has helped us to determine that he may be a better player, so his uncertainly has dropped a small amount (σ ≈ 5.5). The large increase in skill level rating for is a result of Craig being a fairly unknown player, and our confidence in Justin’s placement. Are matches more or less balanced now? We are seeing an increase in balanced matches following the release of the new system. We measure match balance through two methods. One way to gauge balance is to measure the average skill (μ) level of teams that are playing against each other. While the numerical threshold for different ranks has changed, the overall skill of the community has not. Because of this, comparisons with prior Seasons are still both valid and meaningful. As depicted, we are seeing a positive trend in this regard following the release of Operation Red Crow. An alternate method for determining balance is by match results. 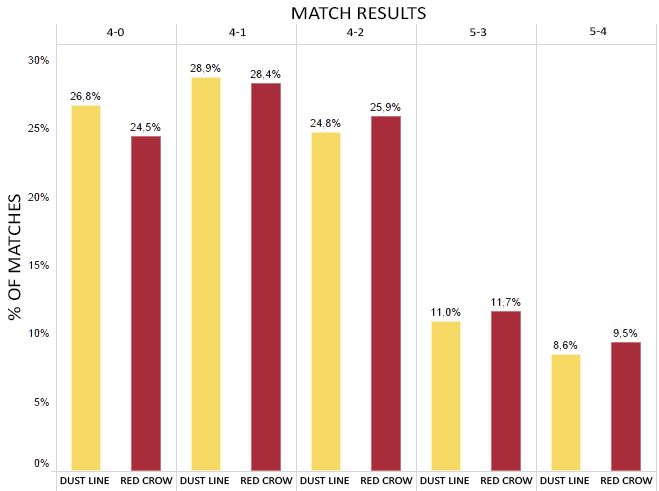 Operation Red Crow is seeing an increase in the number of matches that end with a result of 4-2 and closer. The most notable result is the 2.3% reduction in the number of matches that end in a shutout. This is further evidence that, while the threshold to obtain a certain rank has been adjusted, players are being matched with others much closer to their own ability than in previous Seasons. How does my personal performance impact the number of points I get? It does not. If you get 15 kills per game but lose all of them, then your ability to win a game is very low, hence you should be ranked very low too. Conversely, a player that does not land kills, but still wins often, should be ranked quite high (maybe they make excellent callouts, which is an important factor in a team’s ability to win). The idea is that if you play well, and are an asset to your team, you will naturally win more matches in the long run. This positive influence on winning matches is what we measure. Why do my friends and I gain/lose a different amount of points after a game? If you both have the same skill, the update will depend on how confident our system is regarding where you are placed. Let’s say that you are both Gold IV but your friend has played a lot more games than you (they have a low uncertainty), you will gain/lose more points than they will. Why did the threshold change? Due to the removal of the progression aspect of the MMR, we wanted a scale that was easier to understand, and also easier to link with your skill. The new thresholds have nothing to do with the values of Season 3. Attempting to compare the thresholds from Season 3 to those of Season 4 is similar to comparing apples to oranges. Is there a set number of Diamond players? No, Diamond players are players with a skill higher than a threshold. They represent the tail of the skill distribution, estimated on data we got from previous Seasons. Why does it feel much faster to achieve Diamond in Season 4? 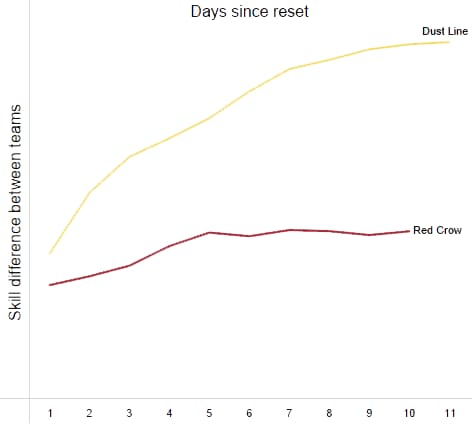 Since we removed the progression system, players do not need to grind to lower their uncertainty in an effort to reach Diamond. Why is it much easier to achieve Diamond in season 4? It is not. It’s just faster for players who deserve it. 80% of current Diamond players already achieved that level of skill in the previous season. Currently, 0.5% of Ranked players in S4 are Diamond players. The 3700 MMR threshold DOES NOT REPRESENT the same skill as the 3700 threshold in Season 3. Why do you reset ranks and how does it impact me? The previous system biased some of our skill estimations. The hard reset (of μ and σ to their initial values) allows us to start fresh and provide you with a more accurate and representative estimation of your skill. Moreover, the major shift in the META introduced with each new Season justifies a reset. Does my smurf account rank up faster than my main? Not after a hard reset, but otherwise yes. This is due to the fact that after a while, the uncertainty on your main account is low enough for us to be pretty confident about your skill. However, your smurf account’s skill should move towards your main account’s skill, assuming you play in a similar fashion. The new MMR system should move the smurf account to their actual rank more quickly, thus minimizing the potential negative impact of smurfs in general. Does casual takes your Rank into consideration? Your clearance level? No. The casual playlist has its own MMR, based on the same system. Your clearance level has no impact on your MMR in either Ranked or Casual. Why does a 40 minute Ranked match give me so few MMR points? The MMR is not a reward system. If we do not have more information about your skill, you won’t move much. Where is the peak of the distribution? Bronze? Silver? If I usually play with the same team, how do you determine the difference between my MMR and the MMR of the other players on my team? We don’t. If you play exclusively with that team, then we will have a fairly good estimation of the MMR of that team. If you start playing without them, then your MMR will change. It won’t represent your skill, it will represent a mixture of your ability to win by yourself and your ability to win with your team, and this mixture will represent the probability that you’ll play with your team: aggregated, it is the probability that you’ll win in general. I enjoyed the sense of accomplishment from grinding for Diamond. Why did you take that away? As previously stated, having a rank that is a good representation of your actual skill leads to fairer matches. Keeping a ‘’Diamond’’ player in Gold because they haven’t played enough matches is not fair for other Gold players. I’m Diamond, why do you match me with Gold players? As there aren’t very many Diamond players, the matchmaking system can occasionally have trouble finding players of similar skill. There is a trade-off between how long you are willing to wait and how balanced the match is. We hope that you have found this to be informative, and that we have answered most of your lingering questions regarding the recent changes. After reading, we encourage you to jump into the discussion on our subreddit and forums! We will be monitoring the activity regarding this topic and may update this document with more questions and answers in the future!